We’d love your help. 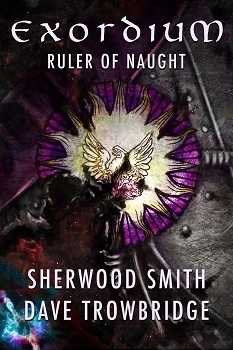 Let us know what’s wrong with this preview of Ruler of Naught by Sherwood Smith. In the sequel to The Phoenix in Flight, Brandon vlith-Arkad, the rightful heir to the Emerald Throne of the Thousand Suns, is the only hope for the restoration of the Phoenix empire. Original. To ask other readers questions about Ruler of Naught, please sign up. Another I forgot to set up here. Rewritten, continues the adventure, but also sets up the next three books which examine the dark side of empire from within, with some side steps for adventure of course, and lots of interpersonal stuff. Because politics is always personal. Great stuff: LGB relationships (made as an aside! I didn't register it at first, then I was like... hmm? And thought back and realised that both the good guys and the bad guys were casually talking about diverse sexual relationships). Also: racial diversity (I noticed the Russian-, Chinese- and Japanese-sounding names in the Panarch fleet, though no SEA names). I liked that Anaris is given increasing complexity as a character. Favourite scene: when Nukiel stops and recognises Brandon - and his si Great stuff: LGB relationships (made as an aside! I didn't register it at first, then I was like... hmm? And thought back and realised that both the good guys and the bad guys were casually talking about diverse sexual relationships). Also: racial diversity (I noticed the Russian-, Chinese- and Japanese-sounding names in the Panarch fleet, though no SEA names). I liked that Anaris is given increasing complexity as a character. Favourite scene: when Nukiel stops and recognises Brandon - and his sinking thoughts about Politics and getting Court martialed. Less great stuff: I really couldn't get into it. It had all the elements that I would like - great worldbuilding, epic storyline... but the multiple plotlines just meant that I didn't really care about the characters. I liked seeing Brandon from other's POV - it's nice how much goes unsaid, but I just did not care. It felt like a drag rather than a delight. I've been reading the revised ebook edition of this series. Not sure how different the original is from the ebook but I read that the authors, while translating them over to electronic format are making them more current. Well whatever they're doing is working for me and I can't wait for the next one.